Get Your Daily Dose of This Highly Bioactive K2 (Menaquinone-7), Available in Lemon, Vanilla, or Unflavored (with a subtle olive oil taste)! ﻿Supplement your diet with these essential K2 drops. Our K2 (Mk7) is sourced from Natto, a traditional Japanese fermented soybean product, which is the highest food source of natural K2 (MK7). The process of fermentation removes soy from the product, and produces vegan, soy-free, all-trans (bioactive) K2 (MK7). It is estimated that 80% of Americans do not get enough K2 in their diet, comparable to the deficiency rate of vitamin D. K2 is crucial for strong bones, helping calcium and other minerals to bind into the bone matrix. Proper calcium absorption diminishes calcification, leading to a healthier heart. How to use: Spray 4 times directly into mouth, once per day or as recommended by a physician or healthcare professional. Q: Can this K2 be used in place of the newborn Vitamin K shot? A: To clarify, MaryRuth's Vitamin K2 is a plant-based, bioactive form of MK7, which is different from the Vitamin K injection shot offered at the hospitals in the US, typically 0.5–1 mg of vitamin K1 administered shortly after birth. If you are still interested in giving our K2 (MK7) to your child(ren), we would suggest you see your physician, pediatrician or healthcare professional and have them assist you in determining if the product is suitable for your child(ren). If it is, ask your healthcare professional to assess what the accurate dosage would be for your child. Each child is unique and different, and we want to make sure that they receive the best care possible! Q: I don’t feel a difference when taking this. Is it doing anything? A: Yes! K2 helps maintain control over calcium levels in your body by controlling where the calcium goes. Vitamin D controls the absorption of calcium into the blood. Vitamin K2 controls where that calcium goes. Without taking K2, calcium can build up in your arteries! Q: What is your K2 sourced from? A: We derive our K2 from Natto, a fermented soybean product which is a traditional Japanese food and the highest food source of natural K2. The process of fermentation removes soy from the product. Please read the 5-step process, from the supplier, regarding the fermentation to a soy-free Natto. Q: What is the Lemon flavor sourced from? A: We use Organic, Vegan Lemon Oil. Q: What is the Vanilla flavor sourced from? A: We use Organic, Vegan Vanilla Flavoring extracted from the vanilla bean plant. I wanted to write and say that I love this among MaryRuth's other products. Specifically, the Organic Vitamin K2 is a product I can feel good about giving to my children. They don't have added sugars or other ingredients I avoid so they are a clear choice over other products geared toward children and my kids love to take their liquid vitamins! We were already taking the liquid probiotic (my daughter's favorite way to take probiotics) and when we tried the K2 we loved it as well. I recently began taking your Organic Vitamin K2. I was so pleased to find your product! Thank you for your passion and diligence in bringing small-batch organic and gmo-free products to the marketplace! I love that you inform your customers so well about each product and stand behind them unconditionally. I will be ordering more. (I get them through Amazon Prime subscription. I hope this does not diminish your profit substantially!) 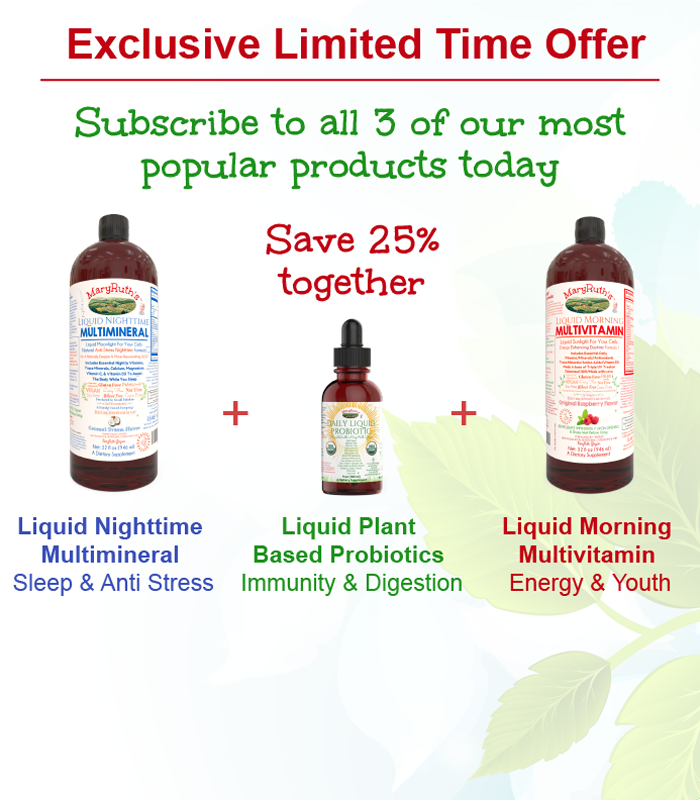 I just put your Night-time Supplement on monthly subscription so will let you know how I like them! Also, I had no idea you can use probiotics topically! You have so much to offer, thank you! I ordered your K2 Mk7 spray and your Vitamin D3 spray. I did a lot of research on different brands that carry those products, but there were so many different additives that I find unnecessary. I wanted it to be vegan, the right kind of the vitamin/mineral, few ingredients other than the actual vitamin/mineral and derived from a safe organic source. That is actually very hard to find. Just sharing with you what I love most about your product. Besides the actual product, definitely the packaging. I love that you have a section on the soy content in your product. I have a friend who desperately wanted to try this product but have children with soy allergies. When I received the product there was a whole page on how you process the product so that there is no soy content left. Awesome! I sent a pic of the explanation to my friend and she’ll be ordering soon if she hasn’t already. I didn’t see this same info on your website unless I missed it, so I would recommend you put it on there so you can ease others’ minds about that. Also, I love that you have a dosage guide for the whole family! I have a 3 month old, 3 and 5 yr old. All five of us including dad and I can take it and I don’t have to guess in the dosage. Keep it up! You have some loyal customers here! Kids love and so does my husband. Has absolutely no taste which is good, and 99% Organic.